The apple is a sacred tree with a long, rich history of lore surrounding it. Aside from its fruit and many medicinal uses, it was revered in ancient times as a talisman of love, healing and immortality. In Norse mythology, the goddess Iðunn gave apples to the gods to keep them immortal. Loki stole them, but had to return them when the gods began to age. In English tradition, one apple was left on each tree after harvest as a gift to the fairies. Apple wood is the traditional choice for magic wands, and a branch laden with buds, flowers and fruit enables the possessor to enter the Otherworld. Considered the food of the dead, apples are associated with Samhain. 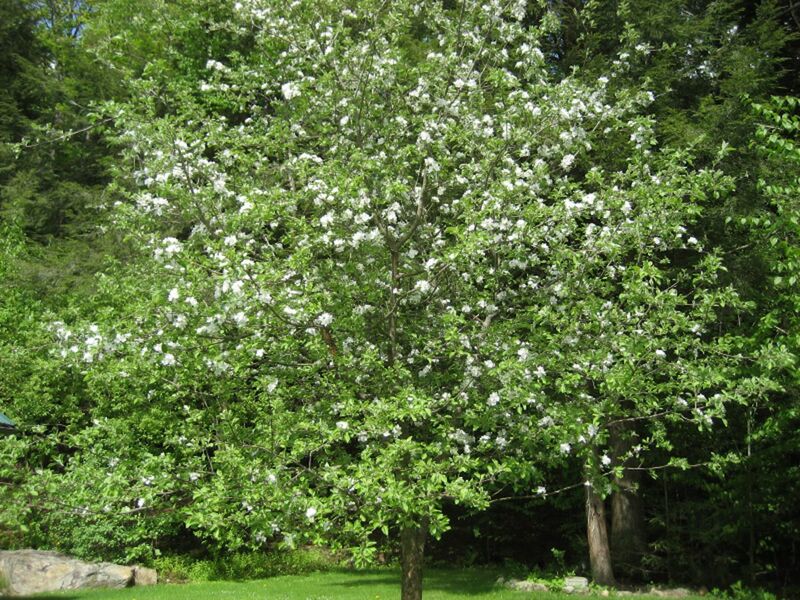 Apple trees grow wild in the woods where I live, and are particularly lovely in the spring, when they bloom. They tend to have dark, twisty trunks and low-sweeping, crooked branches, giving them a spooky air. A while back we bought a sturdy little tree and planted it in the back yard. It took years for the first blooms to appear. This year, it’s loaded with flowers. They smell incredible. My apple tree has stories to tell. The winters are long and rugged up here, and the tree takes a beating, half buried in snow, torn by wind and ice. It split in an ice storm once, right down the middle and partway into the trunk. Heartbroken, I had the desperate idea of pushing it back together and holding it with electrical tape. This actually worked, if you can believe. It healed and now it’s strong as ever. All kinds of creatures love the apple tree. The birds perch in it, and bees and hummingbirds love the flowers. In fall, I throw apples into the woods for the deer. Then there are my illustrious cats. 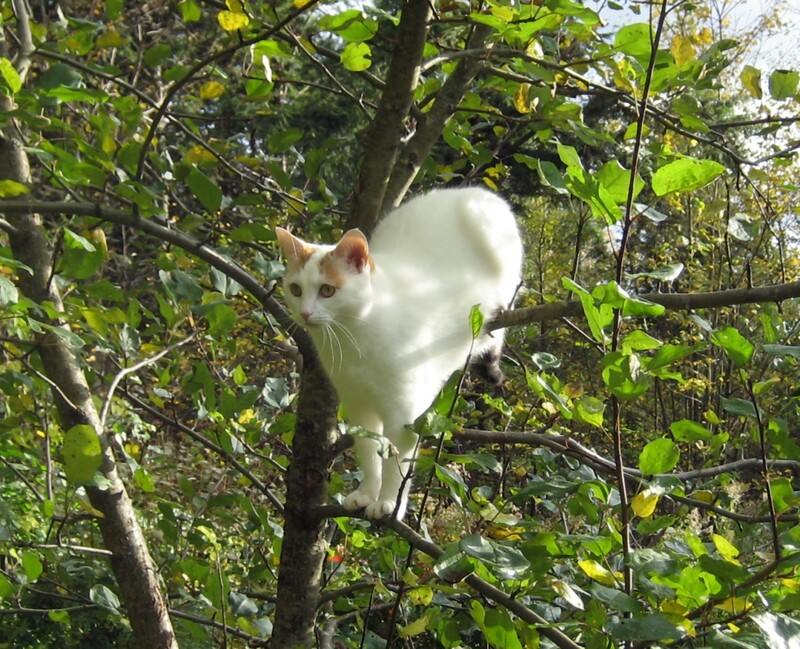 The tree is easy to climb and perch in, and when the leaves are thick a cat can hide in it. Oh, and let’s not forget the spiders. Big, hobbit-eating spiders. They guard the tree and I’ve learned to keep my wits about me. If all goes well this summer, we should have apples coming out our ears. © F.T. McKinstry 2015. All Rights Reserved. Once upon a time there lived a wizard named Kalein who mastered the art of shapeshifting. With the grace of an immortal, she could become any creature, plant, tree or element in the forest. By this she reveled in the beauty and complexity of life. The wise warn that spending too much time in other forms weakens the fibers of one’s humanity. The lore of wizards is rich with such tales; in time, these become folk legends of animals or trees that were once human and forgot themselves. But it is also said that the love of another will keep a shapeshifter on the ground in human feet. A powerful mage named Caelfar loved Kalein with all this heart. She gave her love to him, but the pull of the wilds was stronger. One day, while picking flowers in a high meadow, she spied a crowharrow, a rare immortal hunter with the flawless body of a male god and the wings of a crow. He gave her no more mind than a cat passing through a garden, and vanished into the Otherworld, taking Kalein’s heart with him. From that moment, Kalein forgot the warnings of the wise. She became the wilds, her human nature a mere reed in the rushing river of her life, a dream out of focus. She never saw the beautiful immortal again, as such beings elude the dimensions of mortal perception. One day, Kalein shifted into a sleek, silvery fish with an air of the strange that caught the crowharrow’s eye. He reached through the veil, caught her in his claws, sank his fangs into her tender flesh and ended her longing. Caelfar, shattered and cursed by having used his powers to win Kalein back from the crowharrow’s thrall, erected a statue of his lover in the center of his magnificent garden, to remember her always. Standing in a pool, she has swirling fins in place of feet. The Winged Hunter, Book Three in the Chronicles of Ealiron. Tansel is a gardener with a healer’s hand. Fey, they call her. Her aunt, a dabbler in hedge witchery, calls her cursed. To the most powerful wizards in the land, she is an enigma. It is often said that characters in a story have a life of their own. This phenomenon can be startling to writers, myself included. Tansel first came to me in a fairy tale about a maiden whose love for her garden and a bad attitude towards wizards lead her to a remarkable discovery of her hidden power. But Tansel had more to say when her little story grew into an entire novel involving the forces of the Otherworld, two of the most powerful wizards in the land and a nasty family secret. In the following excerpt, we are introduced to Tansel and the seeds of a shadow. Some things did not stay well in gardens. Tansel knew this, being a gardener like her mother, and her mother before her. She lived deep in the verdant, shadowy hills of Loralin Forest, in a one-room cottage made of river stones. Old clay pots of herbs and flowers crowded small windows with diamond-shaped panes. She owned one small table cluttered with plant stalks, dirt, pots and jars, a mortar and pestle, a knife with a stag-horn handle and a chair with an unraveling reed mat to sit on. She slept on a pallet by the hearth. Dominating the room, a rambling pantry held seeds, dried leaves, twigs, roots and bark in baskets, old cloth bags, stone and glass phials, jars, and wooden boxes. With these Tansel made a modest living. Tansel loved her garden with all her heart. It surrounded the cottage and spread out beneath the edges of the forest like a wild thing, singing. She grew things for eating, seasoning and healing; things that smelled pretty, attracted butterflies, birds, bees, and cats; she grew things for the shapes of their leaves, the way the sun and moon shone upon a petal or a stalk, or the way one thing grew beside another, tangling high and low in arches, tendrils and delicate patterns. Some plants loved the high, bright sun; others preferred the shadows beneath evergreen trees, or water caressing their roots. Tansel grew things she simply liked the names of. Things no one knew the names of. Few could have said exactly what grew in Tansel’s garden. Not even she knew, from season to season. The garden had a rhythm of its own, a balance that took care of itself. Her mother had once told her, Gardens are made of darkness and light entwined. The cottage, the garden and that mysterious piece of information were the only things she had left her young daughter of twelve summers before running away into the lands beyond Loralin like a cucumber vine on a compost heap. Seven years later, Tansel knew what stayed in her garden and not. Tansel appears in “The Trouble with Tansy,” a short story in Wizards, Woods and Gods; and in The Winged Hunter, an epic fantasy tale of desire, lost innocence, and healing. Tansel is also featured in Monsters and Gardening. Her real name is Oona, named after a scrappy character in one of my stories, a shapeshifter who gets herself into trouble for crossing a wizard. It fits, trust me. Oona looks a bit like the white cat in the Henri, le Chat Noir videos. Henri calls his companion an idiot. But Oona is no idiot. 1. Rub against me, making sure to curl tail into a ticklish place. 2. Put wet nose on me. 3. Drag raspy tongue on me. 4. Wait for empty spot on mat and spread out in it before I can. 5. Drag tail across my face. 6. Chew on hair clip. 7. Sit next to me so I have to move or pet her, depending on how cute she looks. 9. Pick a fight with one of the other cats in the room. 10. Get up some place high and knock something off (plants work well). 11. Chase something (sparkle balls, moths, dust, shadows, etc.). Sometimes, Yoga Crasher will take a pragmatic approach (or heed the death threats, however you want to look at it) and jump in my chair for a nice nap. She has ulterior motives for this, of course. As long as I’m on the mat, she gets the chair. From Water Dark, a tale of desire and deception told on a fairy tale landscape of herbal lore, arcane texts, visions, and disasters at the hands of the powerful. Ancient cultures worshiped the sun, moon, rivers, sea and stars as gods. Among other things these forces give life, govern tides and weather, guide travelers on their way and inspire awe, wonder, curiosity and imagination. Sometimes bright, sometimes dark, mysterious and inexorable, these aspects of nature influence every facet of life. They are also capable of destroying it. In this final installment of Nature as Muse, we’ll delve into how watery forces and celestial luminaries have influenced the fantasy world of Ealiron. The consciousness of Ealiron is symbolized by the sun, the origin of light and life. The entity himself is often called the Source. In Aenspeak, the wizard’s tongue, the word solsaefil means “Sun Key.” The Sun Key is an architectural construct that uses the crystal focusing towers maintained by the Keepers of the Eye to mark the movement of the sun. The Sun Keys were built centuries ago by the Keepers and integrated into the castles and landscapes where they lived. To this day, the Sun Keys are honored and maintained by the Keepers’ highest ranked wizards. In the following excerpt, a wizard named Freil explains this to his friend Tansel. The moon emanates peace and mystery like a fragrance . It is a powerful force governing life cycles through the rhythmic rise and fall of the liquid universe. In Ealiron, the moon is a reflection of the Old One, a primeval goddess of birth, life and transformation. The phases of the moon represent the nature of the goddess herself. In this excerpt, a warrior departs the shelter of a palace under a dark moon that cloaks him in magic. Rivers have identities arising from the nature of the landscapes through which they flow. Like any body of water, a river has many moods. The Westlight is a lively river that flows down from a mountain spring in the citadel of Eyrie and down through the city that surrounds it to the south and east. In my upcoming story Water Dark, the Westlight changes from a rocky, tumbling river into a hostile force controlled by a wicked priestess. A wizard named Urien must save his apprentice Rosamund from being drowned. Movement caught his attention. In the distance, Rosamond sat on the edge of the rushing water, on a wide rock, her long legs bared and her face tilted back to the sun like a contented cat. She stirred, then beamed a glorious smile and waved. In a Keepers’ library on the remote island of Urd is a book entitled Legend and the Sea: Interaction. It discusses, in esoteric detail, the relationship between the awesome and mysterious nature of the sea and the stories mankind creates around it. It says: The forces of the sea give rise to imagination, which reflects them according to the nature and disposition of the perceiver. The sea itself is undifferentiated and without bias. In other words, while a sailor might pray to the sea in a desperate situation, a seasoned sailor is not foolish enough to expect her to listen. In the following excerpt, three wizards, one of them a sailor with the power to work the elements, run into seas that care little for their knowledge. An enormous splash resounded off the bow. Samolan swore an oath involving some mountain god as the sky lit up, followed by a thunderous crack. Rain pelted the lantern, sending hissing smoke into the wind. A gust slammed into the mainsail. Samolan eased it out and changed course slightly to avoid running downwind. “Go see what he’s doing,” Samolan said. Lorth was already heading forward. He held onto the boat, shielding his face as the wind shifted and pummeled him from the west. Waves crashed around the hull in chaotic fury, splashing over his feet. When he reached the foredeck, he clung to the edge of the cabin and stared into the dark. “Cimri!” The sky lit up again. Few things bring forth wonder and dreams as stars do. But to one young man, the brightest star in the constellation of Eala, the Swan, is much more than a dream. Sailors called his realm the Swan, for so it appeared to them, the pattern of stars shining on dusk’s fading arc in the seeding time of year. They knew his name, Ciron, as its heart and brightest star. But she knew his touch. She had lain with him in the warm waters on the shortest night, when the wind from the stars caressed the depths and revealed the Gates of the Palace of Origin, and conceived. Natural landscapes are an integral part of any good tale, a multidimensional backdrop that gives life to the imagination. Like music, natural settings fall in patterns, creating moods, thoughts, and impressions by virtue of what they are. Inspired by mountains, forests and all things that grow, the world of Ealiron is richly illustrated with root and leaf, both literally and through ancient traditions of magic honoring the correspondences between plants, trees, animals, color, and sound. Here we will journey through old forests, wise trees, enchanted gardens, fragile flowers, and mountains. Forests get a bad rap in fairy tales. When they are portrayed at their most beautiful, that is when we’d best beware. While a deep, dark wood is an excellent metaphor for the shadowy realms of the mind, there is no denying that forests have a soul. The presence of trees creates a feeling of awe and stimulates the imagination. The following excerpt describes an ancient forest called Eusiron’s Haunt, so called because a god of that name is consciously aware as the soul of the wood. Some say he protects the palace above. Others say it amuses him. To a wizard named Lorth, the Haunt is particularly uncanny. There are forests, and then there are trees. After all, you can miss one for the other. Every kind of tree has its own personality: the texture of its bark, how it roots, the shape of its leaves, or the sound wind makes when it blows through the boughs. The spirits of trees are traditionally associated with qualities such as elemental forces, seasons, colors and life cycles. In Ealiron, different trees correspond with the twelve orders of the Keepers of the Eye, wizards and craftspeople who maintain balance in the world’s energies. There exists a very rare tree in Ealiron called an Om tree. Its seeds are planted by gods, and it lives for many centuries. An Om tree grows in the palace of Eusiron, and is greatly loved by the Mistress of the realm. A garden is a lively place. Plants reach into the soil and up to the sun with chaotic abandon, and yet there is balance; things emerge only in their time, and when the shadows of summer grow long, the garden bows out gracefully. I find joy in participating in this. For my part, I arrange things in nice patterns and keep order while at the same time nurturing the chaos. Tansel of Loralin is born of three generations of wisewomen. Gardening is in her blood…but she has yet to learn the most profound secret her garden is keeping. Flowers are spectacular creations. Brilliant, intense, fragile, and fleeting, flowers capture the essence of sensitive and yet enduring things. When a flower blooms, we know something important is happening. In this excerpt, an immortal being is having a crisis for which simple things in nature, including flowers, offer some perspective. An interesting thing about mountains is how they vary in character from one range to the next. There are old mountains, worn down by time and dark in their knowing; young, spectacular mountains crowned by unmelting snow; lush green jungle mountains; and rugged, arid ones. The creatures that live in the mountains know them.